We made this recipe yesterday, for National Coffee Day. Instead of our favorite after-dinnner coffee—a steaming cup of French or Italian roast with a shot of coffee liqueur, substituting for dessert—we celebrated with a Café Liégeois (lee-eh-ZHWAH). It’s a parfait with layers of iced coffee, ice cream and whipped cream (which is called chantilly—shon-tee-YEE—in French). We highly recommend it as an easy-to-make dessert for coffee (and especially iced coffee) lovers. While the original recipe does not contain alcohol, no one is stopping you from adding a shot of coffee, chocolate or vanilla liqueur. If you don’t have parfait or sundae dishes, use what you do have: beer glasses, wine goblets, any tall glasses, glass mugs. You can even make the recipe in conventional coffee cups, although part of the eye appeal is looking at the layers through glass. A modern variation of Café Liégois. Photo courtesy Benoit Bistro | NYC. Add a layer of cubed brownies, pound cake, or crumbled cookies. 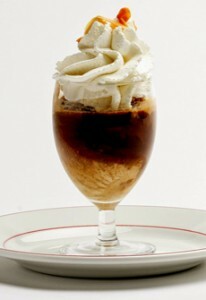 The Chocolate Liégeois replaces coffee ice cream with chocolate ice cream for a mocha effect. 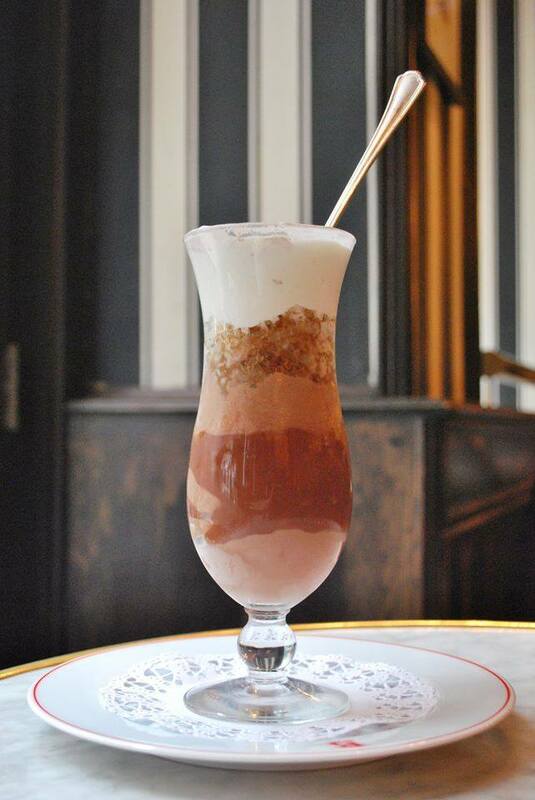 In the photo above, Philipe Bertineau, pastry chef at Benoit Bistro in New York City does his own take: coffee granité, chocolate ice cream, chocolate sauce and whipped cream. 2. FILL each dish or glass with ice cream and pour over the iced coffee and the optional liqueur. Add the whipped cream, garnish as desired and serve immediately. According to Wikipedia, Café Liégeois did not originate in Liège, Belgium; it was originally known in France as Café Viennois (vee-en-WAH), Viennese Coffee. Following the Battle of Liège in World War I, in which the city of Liège put up a resistance to the advancing German army with its Austrian-made guns—Paris’s cafés changed the name of the dessert from Viennois to Liégeois. Curiously, notes Wikipedia, in Liège itself, the dessert continued to be known as Café Viennois for a while. In the U.S., both ice cream desserts are made from the same ingredients. The difference is in how the ingredients are presented. An American parfait shows its ingredients in layers: ice cream, syrup, fruit. It is traditionally served in a tall, narrow, short-stemmed glass, and topped with whipped cream. A traditional sundae dish is a wider, tulip shape with a scalloped rim. First ice cream is scooped into the dish, and it is topped with syrups, fruits, wet walnuts and crowned with whipped cream a maraschino cherry (today a fresh strawberry is often substituted). Crushed nuts and sprinkles can also be added. The sundae was invented in the U.S. Here’s the history of ice cream. A French parfait differs from the American version. It is a frozen dessert made by folding fruits, nuts and/or other ingredients into whipped cream or egg custard—more like a semifreddo or frozen soufflé. See the different types of ice cream.